This Outdoor Guide to Grand Rapids is made in partnership with #ExperienceGR, for nature enthusiasts like us. What better way to balance an exciting trip to the famous Beer City, USA than soaking in the outdoors? While Grand Rapids, Michigan might be brimming with breweries, museums, and noteworthy restaurants, visitors can also enjoy the destination's lush offering of nature and adventure. Thanks to the hotspot's ideal proximity to Lake Michigan and outdoor recreation, I found Grand Rapids to be perfect for travelers like me: outdoor enthusiasts who want a combination of nature and wellness, gastronomy, and walkable cities. So I created a list of things to do in Grand Rapids for visitors who love outdoor travel. If you're like me and always searching for ways to get moving when you travel, you'll definitely love these suggestions. After visiting Grand Rapids for four days, I can say many of these activities ended up being some of the most memorable experiences out of the entire Michigan road trip! 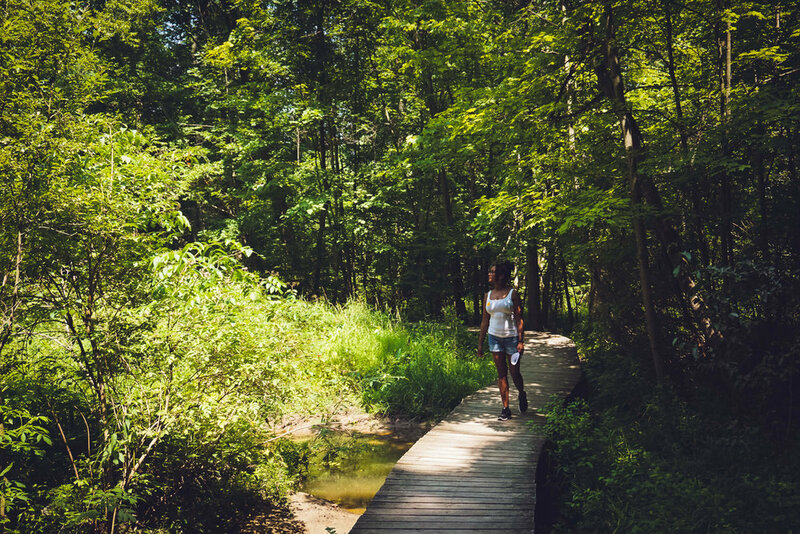 Just a 12-minute drive from downtown Grand Rapids, you can visit a wooded haven with over 264 acres of nature and six miles of trails. 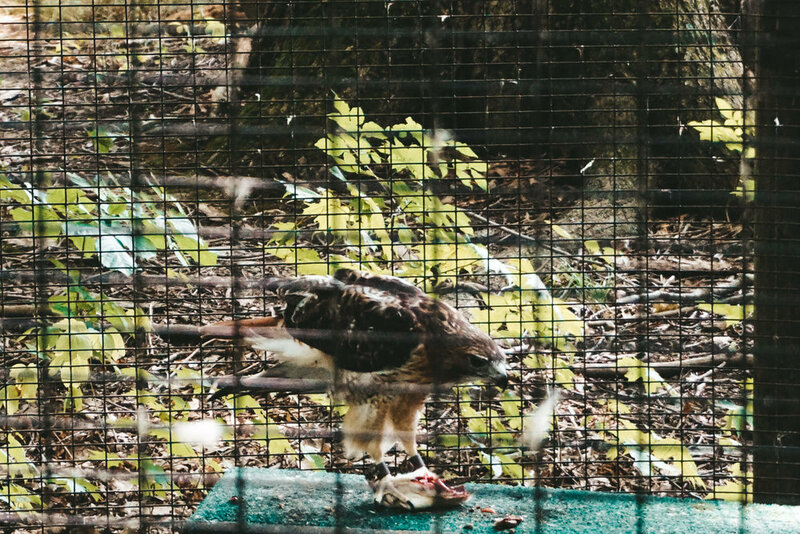 The Blandford Nature Center was one of my favorite outdoor activities during my Grand Rapids visit because it offered a close look at rescued wildlife and their ecosystems. Some of the animals I saw included turtles, snakes, owls, an osprey, turkey vultures, hawks eating their prey (mice), and a bobcat hiding in the shade for a nap. Most of these animals call the Blandford Nature Center their home because they cannot survive in the wild (due to severe injuries or other circumstances). Grab a map and take your own adventure along well-maintained trails while listening to the songs of birds sweeping over you. In the winter you can explore the Blandford Nature Center's trails with cross-country skis and rented snowshoes. Four miles from center city, you can escape to Grand Rapids' most acclaimed outdoor attraction: The Frederik Meijer Gardens & Sculpture Park. With over 10 million visitors since its opening, and 158-acres of handicap-accessible sculpture and horticultural experiences, the destination is a botanical favorite -- and for good reason. At the park, I fulfilled my outdoor wellness fix with a serene walk through what is now my favorite Japanese Garden in the country. The eight-acre sanctuary weaves contemporary sculpture with traditional Japanese garden elements, and was designed by Hoichi Kurisu: a Japanese landscape designer born in Hiroshima and trained in Tokyo. 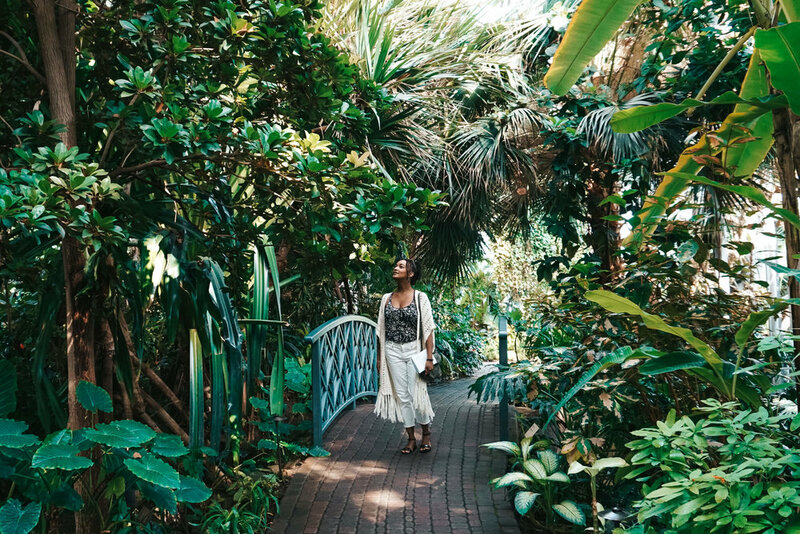 Besides its elaborate gardens, you'll love the outdoor amphitheater, 1930's-style farm, tropical conservatory, and internationally-acclaimed sculpture park. When I tell you two bald eagles were soaring above our heads as we canoed down the river, I mean two-bald-eagles-soared-above-our-heads-as-we-canoed-down-the-river! We'd both seen eagles before, but this time was different. It wasn't just gliding by as we drove down a highway. It didn't flap its wings in a faraway distance, making us question our own eyes. They were right there. Clear as day. To be honest, we didn't know what to expect at first -- we didn't even know which river to canoe, let alone what wildlife we'd see. So when GR Paddling (the canoe and kayaking company we used) picked us up from our hotel, we let Jeff (the owner) take the reins and bring us to the most scenic route we could experience: the Grand River. No one else was on the water that Thursday afternoon, so we became less distracted with chitter chatter and more connected with the nature around us. Halfway through, when we finally spotted the nest and its watchful owners, it felt surreal. 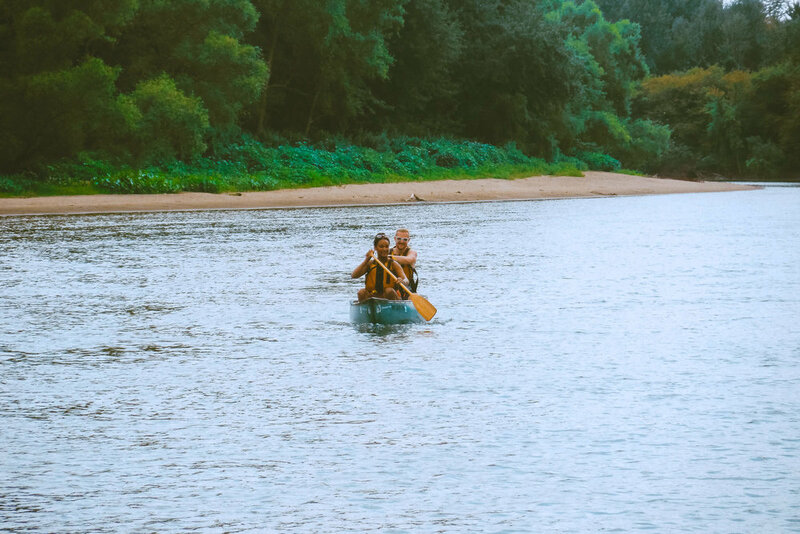 If you have a bit of time for an adventurous excursion in Grand Rapids, I definitely recommend the 6.5-mile route down the Thornapple and Grand Rivers in a canoe or kayak with GR Paddling. Things to know: This is a door-to-door, full-service experience. You get picked up, the owner recommends a route to take if you're undecided, and you leave your stuff safe in the van. Jeff does not canoe with you (although he could if you don't feel comfortable alone); he drives ahead and meets at a couple of check points to take photos of you coming down (and to make sure you're on the right track). The 6.5-mile route took us a little over 2 hours to complete. Grand Rapids has an elaborate network of parks and trails that are perfect for outdoor and fitness enthusiasts looking to feed our daily step and exercise goals. True story: my most frequent quote lately is, "Hold on, let's walk one more loop -- I've got to get my Fitbit steps in." To make the most out of your stay in the city head to the large urban park, Riverside Park and stroll their walking and biking trail along scenic views of the river, ponds, and nature. With 100-acres of land and many areas dedicated to community activities, picnics, and sports (we even briefly watched a little league baseball game), Riverside Park is an ideal location for outdoor enthusiasts. We spent a couple of hours walking their paved White Pine Trail and passed plenty of locals and visitors grilling, picnicking, launching their boats into the Grand River, and more. There were restrooms, scenic views, and plenty of parking. If you love European history, nature, and gardening, you'll be thrilled to discover Holland, MI right outside of Grand Rapids. The town is known for being home to the only authentic, working Dutch windmill in the country, as well as attracting thousands to its Tulip Time festival at the Windmill Island Gardens. When tulips are not blooming, there are plenty of seasonal flowers and perennials in their place to match the colorful row of 18th-century Dutch home replicas. Once you're done exploring artifacts and treasures gifted from The Netherlands itself, trying on wooden clogs, or channeling your inner folk dancer to an authentic street organ, you'll find acres of land and gardens to explore. Along the way, stop by the horse pasture and rest at one of the benches to take in the nature around you. Right in the heart of Grand Rapids you can take advantage of free dance classes and concerts at Rosa Parks Circle. Created by international artist, Maya Lin, it is a 3.5-acre functioning sculpture that converts into an ice skating rink in the winter. During the warmer months (May thru October), make exercise fun while outdoors by joining GR Swing's free swing dance lessons on Tuesdays at 7pm, or get moving and grooving at one of the urban park's many outdoor concerts. When I heard about a dune trail leading to the beach right outside of Grand Rapids, I immediately thought of the dunes I climbed in Death Valley, California and Huacachina, Peru. I didn't realize how much dunes could vary, and the extent of Michigan's coastal dunes. Saugatuck Dunes State Park's fresh water coastal dunes can go as high as 200ft tall, and range from steep slopes to hills. After listening to the third city local strongly recommend we visit the park, we put on our hiking shoes and swimsuits and headed out to Saugatuck for an afternoon at the Lake Michigan shoreline. We took a fairly easy beach trail that led us through wooded dunes and revealed 2.5 miles of a practically untouched shore. The opening of the trail invited a crowd toward a small beach, but we could walk along the narrow shoreline's shallow water to secure our own, secluded spot. After the 2.5-mile hike on a 91°F day, this was just what we needed (and only a 40-minute drive from Grand Rapids center city). I may not be a fan of winter but I'm always open to hitting the slopes during the summer! While time didn't allow for us to visit, Cannonsburg Ski Area is a popular ski resort in the Grand Rapids area and was recommended by fellow outdoor enthusiasts. It has five fun zip lining stations for adventurists looking for a bit of thrill, and only costs $35. Did you know Grand Rapids offered so many outdoor gems? Grand Rapids is more than just a beer destination. Wellness getaways, outdoor activities, and excursions that celebrate all-things nature are available everywhere you turn! With proximity to Lake Michigan and plenty of activities on and near the Grand River, outdoor enthusiasts will enjoy the city's scenery and community just as much as its art, food, and beer. To learn more about Grand Rapids, visit ExperienceGR.com and search for experiences by interests or neighborhood. Share this post if you found it interesting or useful!